This is very much on my radar (yes, it was Claire and Stu who made me aware of it as well). Good to hear you enjoyed it too. I loved it, Marina – it’s just so atmospheric. I bought it off the back of recent reviews by Claire and Elena, and I thought Stu must have blogged it! I’d love to hear your thoughts on Nada if you do read it. Evocative extracts and yes it is a stunning beginning, the excitement and anticipation of Barcelona and the reality of a late arrival and a sombre welcome. 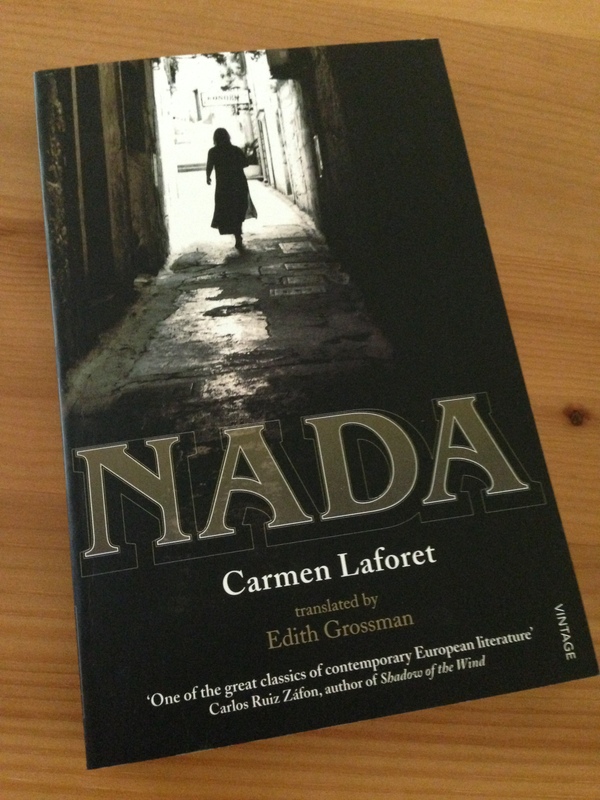 Thank you, Claire, for putting me on to Nada as I hadn’t heard of it before your review! Yes, I thought it very evocative, and the opening is so compelling for all the reasons you state in your comment. The novel also left me pondering just how traumatic life must have been in Spain during this time. O no another for the TBR ! I am visiting Seville at end of Aug …..any suggestions of books set there would be appreciated! I’m afraid so, Helen – sorry! It is a terrific novel, one that appears to capture the intensity of its time and place, as well a story of a young woman trying to find herself. I’m trying to think of a book set in Seville, but nothing springs to mind at the moment. I’ll come back to you if I hit upon one, but I suspect we may need to seek advice from Stu or Richard (or others participating in Spanish Lit Month) – they’re the experts! Arturo Pérez-Reverte’s The Seville Communion is a decent enough contemporary thriller set in Seville. For something way older, Tirso de Molina’s The Trickster of Seville is a good 17th century theatrical option (Don Juan, swordfights, revenge from beyond the grave). Thank you for your suggestions, Richard. I’m sure Helen will appreciate this! I loved this too when I read it a couple of years ago. I loved the style, the atmosphere. Oh, fantastic – that’s great to hear! Thanks, Caroline. Looks like we’re both reading of the shadowed side of Barcelona for Spanish lit month! Tony said keep it in August for Women in Translation, which would fit the evil woman in Barcelona Shadows, too, but I also liked your idea of keeping the dark books for autumnal/winter months. I’m picking up Binocular Vision today; by some miracle our library has it! Doesn’t it just! I’ve got some other books lined up for Women in Translation (#WITMonth) in August. Are you planning to join that one, Bellezza? I’m aware you’ve got your Japanese Lit Challenge on the go at the moment, and there’s only so much one can commit to. Oh, that’s a piece of luck with Binocular Vision – I hope you enjoy it! Do let me know what you think of Edith Pearlman’s stories – I’d be very interested to hear. .
Great review in that you seem to have captured a lot of feeling for the book. This does sound somber and dark. Of course some of the greatest book are. Indeed Post Civil war Span must have been a terrible time for so many people. I like the Mario Vargas Llosa. Art and literature can really derive beauty out of the terrible. Thank you, Brian; it’s good to hear. That’s just what I was aiming to get across in my review. Yes, this novel left me considering just how terrible life must have been in Spain during this time. The Mario Vargas Llosa quote is very apt, as is your final point on art and literature’s ability to extract some beauty out of the life’s traumas. Thank you, as ever, for your comments. Oh, that’s interesting, Stu. That sense of intensity, of lives damaged by the Spanish Civil War, really comes across in Grossman’s translation, doesn’t it? She’s done a tremendous job with the text. I’m not familiar with Cela (Camilo José Cela?) – what have you read by him? Fine review of a fantastic debut novel, JacquiWine! I think Nada made my Top 10 list for 2011 if I’m not mistaken: I loved the shadowy, almost gothic elements of the story that you touched on, of course, but I was really blown away by what a distinctive, powerful first person voice Andrea bore throughout the novel. What a compelling, memorable and believable character/narrator. Thank you, Richard! Yes, the near-gothic atmosphere is evident from the opening when Andrea arrives at the Calle de Aribau apartment – I loved this element, too. That’s a very good point regarding the strength and distinctiveness of Andrea’s voice. As you say, such a memorable and compelling young woman, and what strength of character to maintain a sense of sanity in the midst of this fractured environment. It seems as if Laforet may have drawn on her own life experience when writing Nada, and I’m sure this helped her construct such a credible, authentic voice in Andrea. Thanks for dropping by. Spanish Lit Month seems to be going well – I’ve seen quite a few reviews flying about! Really enjoyed your review. I’m spending the year trying to read as much Spanish Fiction as I can so thanks for the heads up on this one. In several those I’ve read thus far it seems the Civil War frequently casts some pretty long and pretty dark shadows. Thank you, Col, and thanks for dropping by. ‘Nada’ is considered a classic of 20th-century Spanish literature, and many readers have loved it; I hope you enjoy it, too. I thought it very evocative of its time and the dark shadows cast by the Civil War, and it’s an extraordinary debut novel. If you’re reading Spanish fiction, you’re probably very familiar with Javier Marías (I’ve reviewed ‘The Infatuations’ here on the blog if it’s of interest). I’ll also be posting my thoughts on ‘Never Any End to Paris’ by Enrique Vila-Matas – the review should be up here next Thursday. Do you have any recommendations from the Spanish fiction you’ve read to date? It’s always useful to hear what others have enjoyed. I’ve ordered ‘Nada’ today and looking forward to it! I’ve read Javier Marias but “A Heart So White” – really liked it. I’ve got The Infatuations on the proverbial shelf so will have a look at your review. Of the Spanish works I’ve read so far I loved Soldiers Of Salamis and The Enormity of the Tragedy but my favourite was easily The Yellow Rain by Julio Llamazares. Have you read it? If not I thoroughly recommend – I thought it was a fantastic book. Oh, that’s excellent – I’d be interested to hear what you think of ‘Nada’. I loved ‘A Heart So White’ (in fact it’s one of my favourites from the books I read last year). I haven’t read ‘The Yellow Rain’, but I’m going to check it out – thank you! And I do want to try something by Javier Cercas at some point, so it’s good to hear you loved ‘Soldiers of Salamis’. Another couple of books for the list. I’m really glad you like it. It is a complex, dark and twisted novel, isn’t it? I couldn’t believe that I had to read such boring and long novels back in high school – all written by men – while Nada sat there forgotten, waiting for a wonderful Spanish literature professor to discover it to me. Also, it’s Premio Nadal (like the tennis player). Yes, very much so, with that darkness and complexity reflecting the mood of Barcelona at the time, I suspect. What a pity this novel wasn’t part of your high-school syllabus as it would have made for a fascinating analysis. I’m glad to have discovered it by way of you and Claire, so thank you. This was on my short list of books to pick for Spanish Literature Month, but I went with others instead. My loss, but only a temporary one, as thanks to your review I’m eager to pick this one up. Oh, that’s interesting, and great to hear that you’re keen to pick this one up! I found it hard to select three or four to read as there are so many terrific books in the Spanish language…and I keep adding others to my ‘to buy’ list as the reviews come through. What a fantastic review… of what sounds like an incredible read – I’m already hooked and desperately want to see what lies ahead for Andrea, especially given the gothic feel…on my MUST read pile. Very welcome. I loved it and the time of reading, and it has held up well in my memory too. An atmospheric story with a powerful first-person narrative, quite an achievement for a debut.